One thing led to another. I was interested in trying the new 65% cotton/ 35% rayon mix, Willow Yarns Ripples. 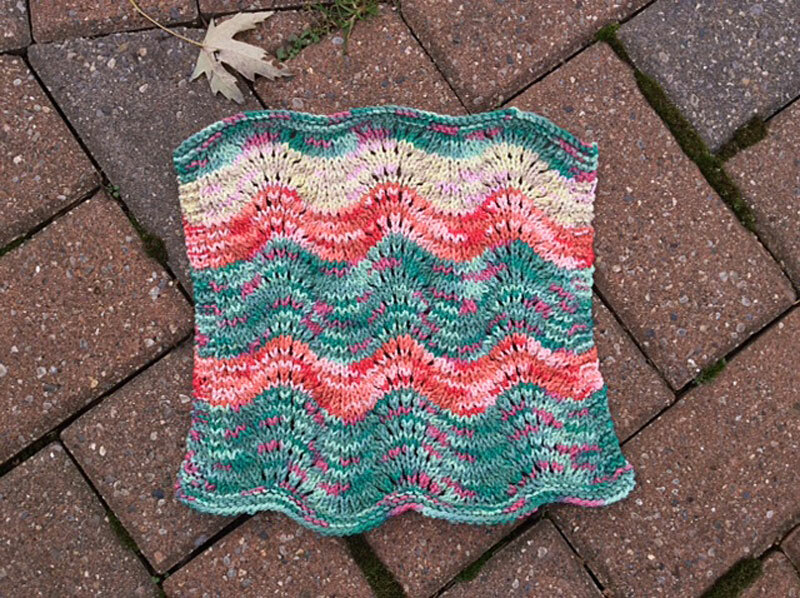 Ravelry had a link to half-a-dozen free dishcloth patterns by Rae Blackledge that called for Ripples. 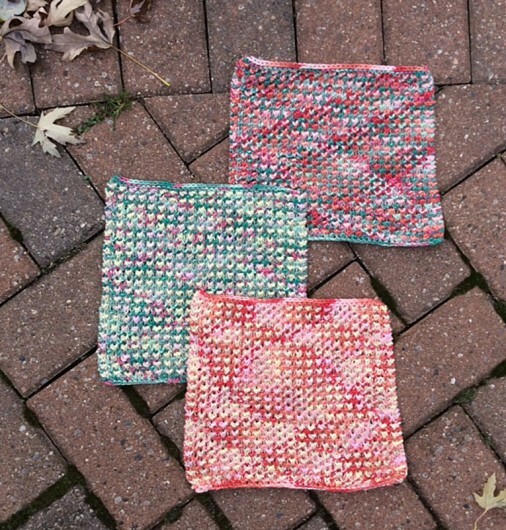 Blackledge calls the bunch her “Color Study Dishcloths.” My knitted dishcloths have almost all seen better days. I was quite taken with the color combination of Milk, Jade Water and Peachy Keen. And so I was off to the races. That’s “Crazy Chevron” with the colorful zig zag. And “Garter Blocks” is the shy one in the left front bottom row. Those patterns were spot on correct. The other two were not quite ready for prime time. “Slip Stitches” is knit mostly in the milk colorway, with the rows of jade green near the start. It only works if you cast on 59, not 60. That will give you the multiple of 2 sts plus 7 that the pattern calls for. And rows 3 and 4 of the pattern need to end this way, not what’s written in the pattern: repeat from asterisk to last 4 stitches, slip 1 wyif, knit 3. That jade green guy on the bottom right is Bubble Stripes. You need to work the tweed stitch on the right side rows. The even numbered rows are wrong side, not right side as the pattern directs. On the tweed stitch, the directions are to pull up a loop (lp) two rows below the next stitch to be worked and knit 1 stitch and pass the loop over the knit stitch. I understand that to mean you pull up a loop from the right side. As for me, I’m underwhelmed on that one. There are two more cloths in the Color Study set. I tried “Stair Steps” but it has errors and also turned into an unpleasant knit, with a zillion ends that would need to be woven in. That’s bad news for a dishcloth. It needs to live a hard life. This much I figured out before quitting: the 4th time you work with the “B” color I am pretty sure you need to pick up 5 stitches, not 3. The big problem I had was that after a few pickups, I ended up with mismatched garter stitch. You are told to pick up and knit. But when you get to the stitch holder stitches to do that, the stitches need to be purled to maintain garter stitch continuity. I tried to solve that by picking up in purl. Designing patterns is not my forte so I gave up. There’s a “Triangles” cloth also. When I saw that an experienced knitter on Ravelry reported she must have made a mistake because it didn’t work out, I decided to take a pass on Triangles. Instead, I used the rest of my yarn in my own color study. This trio is Andrea Springer’s wonderful free pattern: Bee-utiful Dishcloth. You work the honeycomb pattern in two colorways. I was surprised by how much variation resulted. I even like the pooling of the colors. You have to stay alert in this pattern because it’s a bit difficult to rip back if need to. But I really like the result. I had enough leftovers to try one more: Modified Feather and Fan Cloth, a freebie by Mary Ann, of MissWoolyKnits. 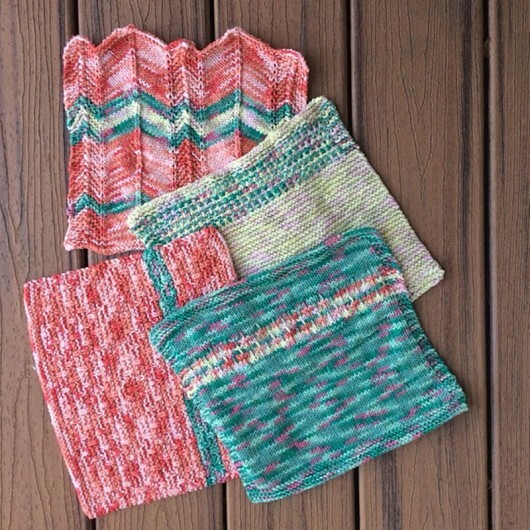 Rather elegant–especially for a dishcloth. 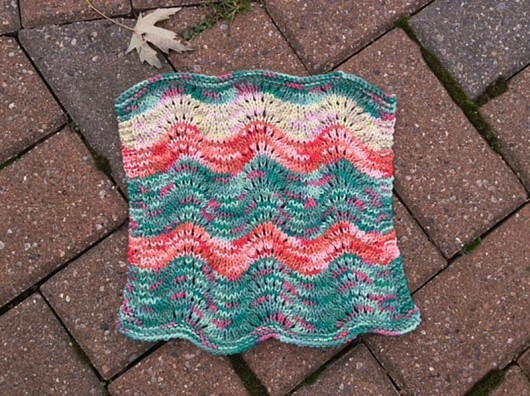 After all this maybe you’d like my take on Ripples as a dishcloth yarn? Let’s leave it at I think it would make a nice lightweight sweater. Or even something for a child because it’s soft, drapes wonderfully well, and feels good next to the skin. Those aren’t especially sought-after traits for sopping up gravy drips from the kitchen table or cleaning dirty dishes.